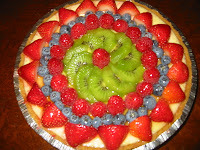 Anna Madden Living: Homemade cheese cake? Last weekend, Anneke, her family, and I attented break fast in Northeastern University in Boston. Unfortunately Angus and the kids couldn't come because Benny had a hockey game that time. :( It was a potluck party, so everyone brought some food. Anneke brought delicious Soto Betawi and I brought two cheesecakes. I wanted to bring Indonesian food but I don't have confidence in my Indonesian dishes yet. It is easy to make the crust, but I didn't have time to make it, so I got two of them at the grocery store. For the filling, I used cream cheese and mascarpone cheese. 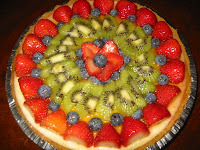 It was the first time I made these cakes decorated with fresh fruits. What do you think guys? Not bad huh?! Angus asked: "Do you want to make a cheesecake business, honey?" My friends didn't believe that I made these cheesecakes. They thought I bought it at the grocery store. Well yeah but only the crust :) They loved it. Yay!!! I'm glad everyone enjoyed them. Clik here for the recipe.